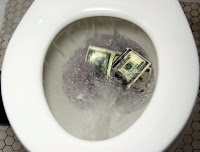 Stocks sure got flushed down the toilet today. Needless to say, the scene at Alert HQ was somber and today's picks lean strongly to the sell side. In any case, we need to soldier on. This post is announcing that Tuesday's Swing Signals, Trend Leaders and Trend Busters are now available at Alert HQ. All are based on daily data. 54 Swing Signals -- 12 BUY signals and 42 SELL Signals. 179 Trend Leaders, all in strong up-trends according to Aroon, MACD and DMI. We have only 31 stocks that are new additions to the list and 343 that fell off the previous list. 16 Trend Busters of which 3 are BUY signals and 13 are SELL signals. Two days of trading this week, both down and today worse than yesterday. Over the weekend, we proposed that a pullback was due within the next two weeks. It seems we got it within the next two days. We also proposed that the drop in stock prices would amount to 5% to 10%. Well, we're half way to the 5% already. A third concept we proposed over the weekend was that a rotation was about to take place out of financials and into tech. As we saw today, financials led the market down, losing nearly 5% in one session (thank goodness for the stop that got us out of UYG). Tech took a beating but definitely ended up in better shape than the financials. Looking at our signals from Alert HQ, the pattern is clearly apparent: SELL signals outnumber BUY signals across the board. The number of stocks on our Trend Leaders list has just plunged from 491 over the weekend to just 179 today. We are clearly in a short-term slump. But here's what's interesting. The S&P 500 can fall from where it closed today at 998.04 down its trend line at 959 and it wouldn't dent this rally. So that's another 4% down before investors should begin to sweat. So don't get flushed away yet!